Kona MinUte on a bus bike rack! Kona MinUte on a bus bike rack! Who’s your daddy? 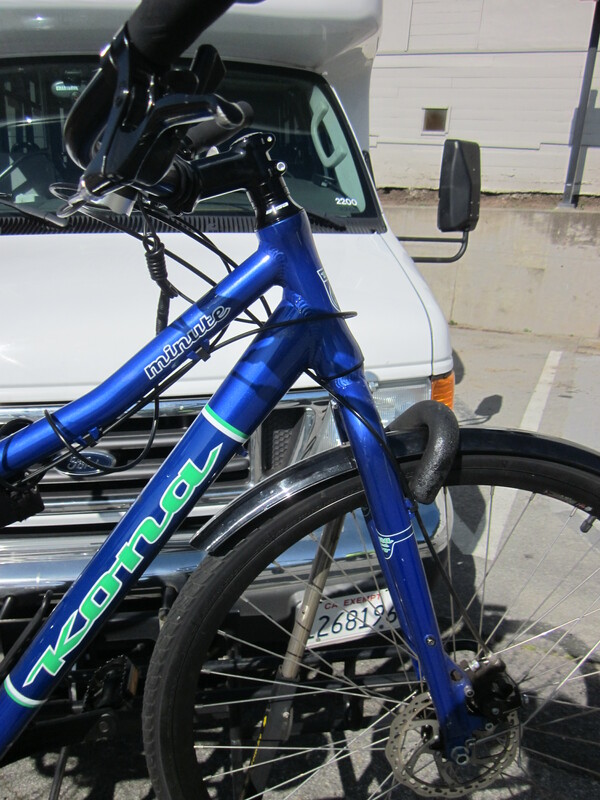 One of my complaints about the Kona MinUte has been that it is just a couple of inches too long to fit on a bus bike rack. In the city, and given the way we use the bike, this is a noticeable limitation—my usual strategy when we’ve forgotten a kid’s helmet or have too awkward a load or have a tire low on air is to load my bike onto a bus rack (or in the case of the Brompton, under my seat) and head home that way. This isn’t an option with the MinUte. Or rather, it hasn’t been. But I had never seen another medium-tail bike so I assumed that this was just the way things were. That is, until I saw this beautiful medium-tail bike on the BikePortland twitter feed. 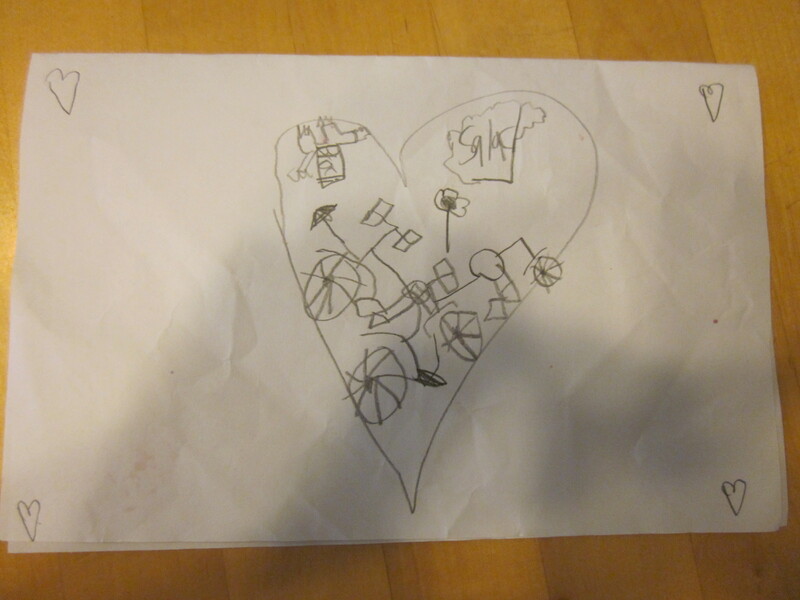 I had no idea who made it; I had to read the logo on the bike: Ahearne. 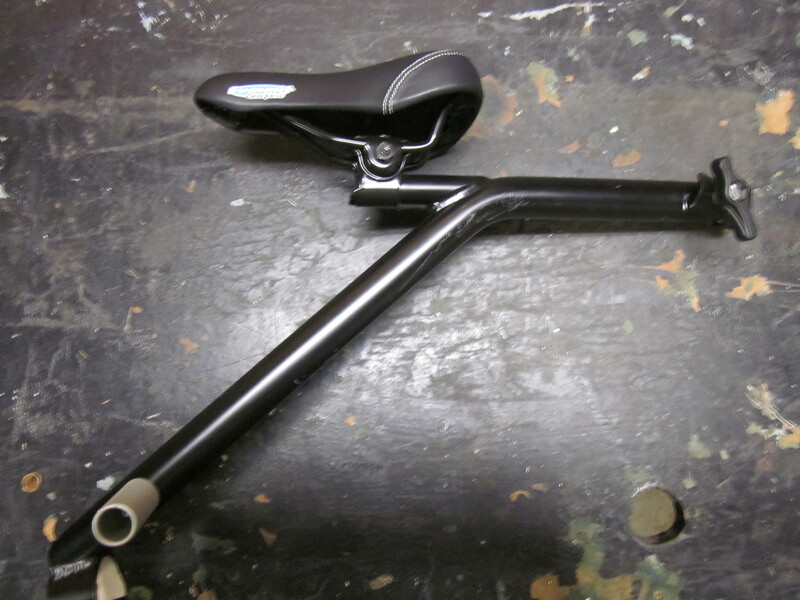 So I wrote to Ahearne Cycles to ask (a) did it fit on a bus bike rack? And (b) was this a model they were producing? Joseph Ahearne wrote back: the answers were yes and no. The bike was custom, a one-off. 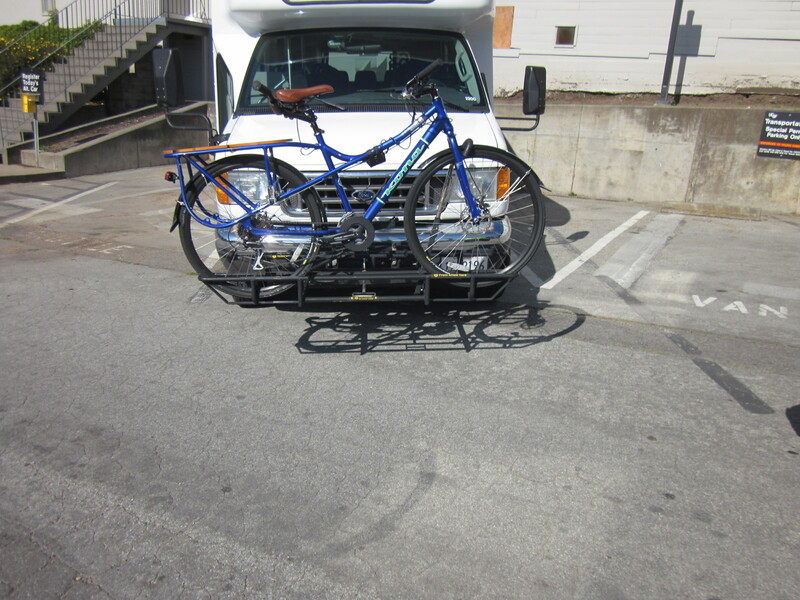 But it was customized to fit on a bus bike rack. 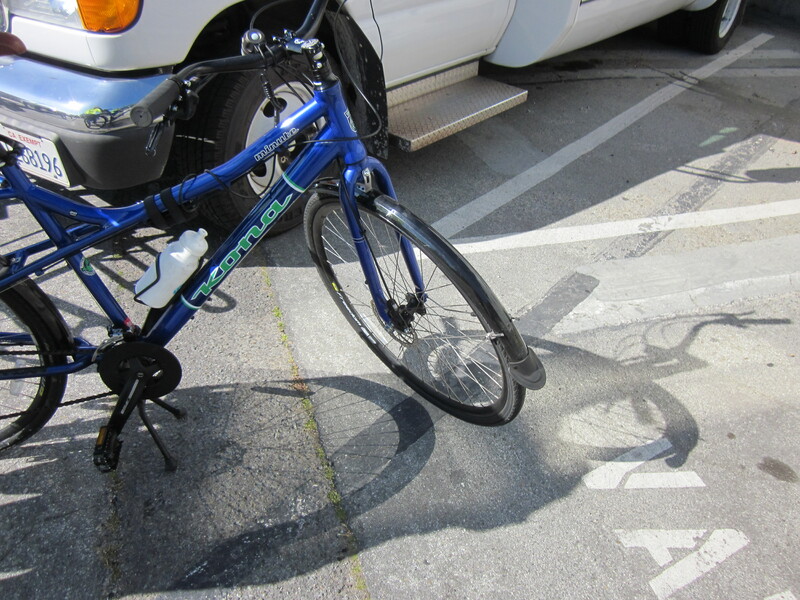 To make it work, the front wheel rotated 180 degrees to shorten the wheel base just enough to fit on the bus rack. That way, the front fork pointed backward instead of forward, shaving 3-4 inches off the length. I thought “Joseph Ahearne is brilliant!” but assumed this had no relevance to the MinUte. 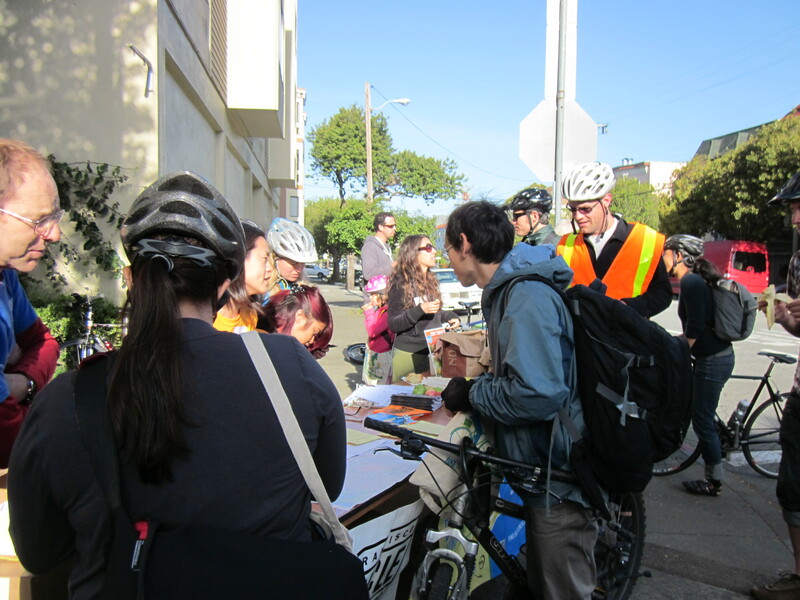 That is, until Mission Sunday Streets earlier this month. We were eating donuts on the back deck when another rider bumped into the bike, knocked it over, and spilled my daughter’s milk all over the sidewalk. She was traumatized and he was apologetic, and he kindly bought her a replacement. But I was transfixed, staring at the front wheel, which in the fall had rotated exactly 180 degrees. 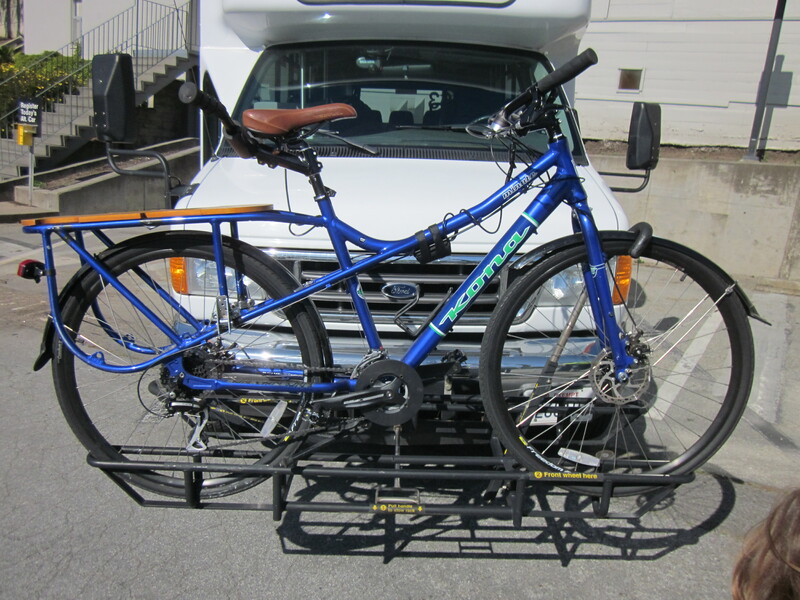 Could we put it on a bus bike rack just like that custom Ahearne? It wasn’t until this weekend that we found a bus with a bike rack that would let us fiddle around and see. Last week we realized that the university parks its shuttles, complete with bike racks, in the lot behind my daughter’s preschool on weekends. Matt was game to ride the MinUte (although without any kids on board) up the brutal hill to preschool to try it out—the kids and I walked. When we got there, we flipped the front wheel 180 degrees and tried it out. Bingo! MinUte on a bus rack! It is still a tight squeeze. The MinUte has big wheels (700c, or 29”, rather than 26”) and they are already a little larger than the front wheel space allotted on a bus rack—the bottom of the rack has a crosspiece that’s supposed to sit at the back of the front wheel, and the space is a little narrow for such large-diameter wheels. As a result, the front wheel doesn’t fully seat on the bottom of the bus rack. However after some efforts to dislodge the bike (meaning we yanked on it), we concluded that the spring-loaded support arm at the front holds the bike steady nonetheless. I would trust this setup on a cross-town ride. Here’s a close-up of the support arm bracing the front wheel, just above the reversed fork. We’d also been talking about putting a front basket on the front of the MinUte. 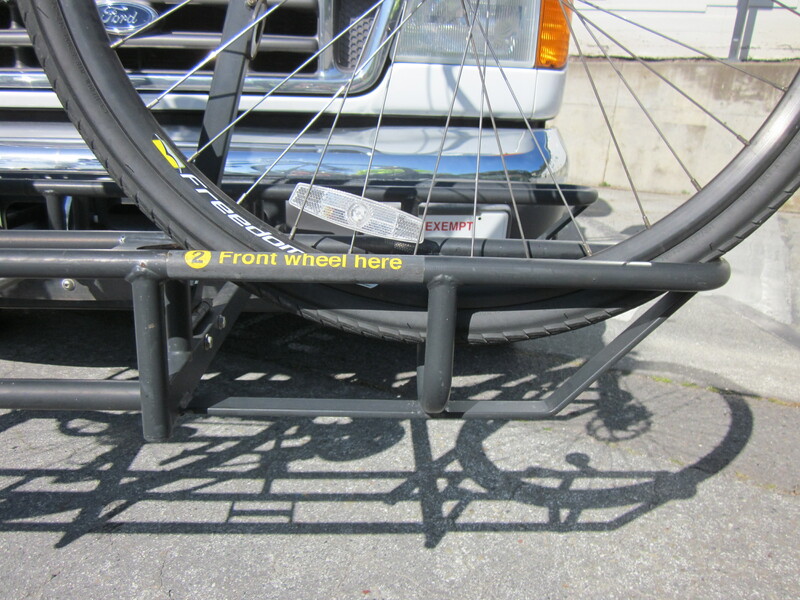 To get it on a bus rack, this will have to be frame-mounted; a traditional basket mounted to the handlebars and/or the fork would prevent the front wheel from making the full 180 degree rotation needed to load it. So now we have to get a special frame mounted front basket on order to get the front carrying capacity we wanted. This is a price we’re willing to pay. Another view, because it’s awesome! Admittedly it looks goofy with the handlebars reversed. There are still some things I’d change about this bike. We’re definitely upgrading the brakes, and the kickstand, although burly, is less stable than we’d like when we put two kids on the deck. A chain guard and dynamo lights would be welcome additions to a bike that Matt uses to commute. And as mentioned, we want a front rack. But these are all changes we can make over time—the only thing we felt was impossible to change was our inability to load it onto a bus. And now we can. You can wear a helmet while riding a bike, or you can not wear a helmet. 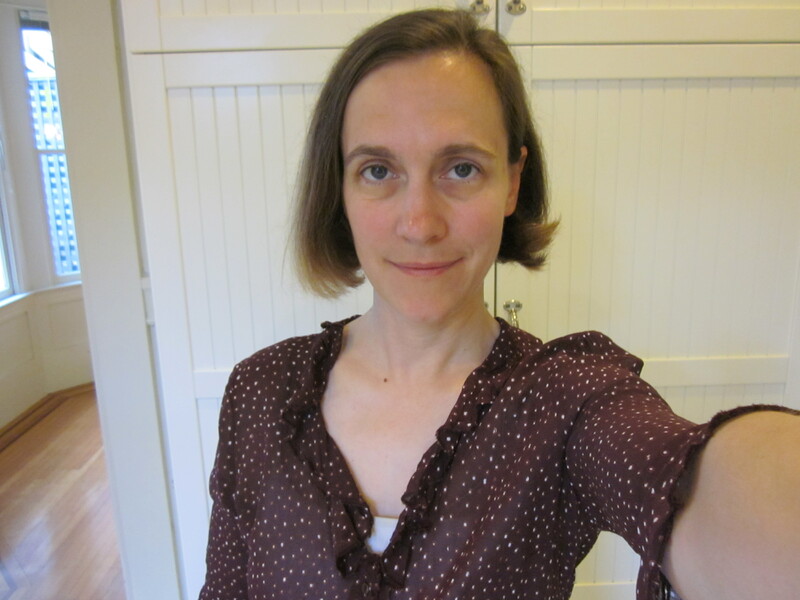 There are arguments both ways; personally, I choose to wear one, but I understand that reasonable people choose not to, for reasons that are just as valid. But lately I have seen something that makes zero sense to me: people who do not wear helmets, but still carry them around. And I have seen a lot of this lately. This choice seems to combine all of the disadvantages of wearing helmets (inconvenience, lack of style) with all of the disadvantages of not wearing helmets (reduced safety, judgment of passers by). Why? On Mother’s Day I was exhausted after a long (for me) ride the day before in the wine country. Although I rode out on an errand late in the evening, I didn’t do anything else on my bike on Sunday. 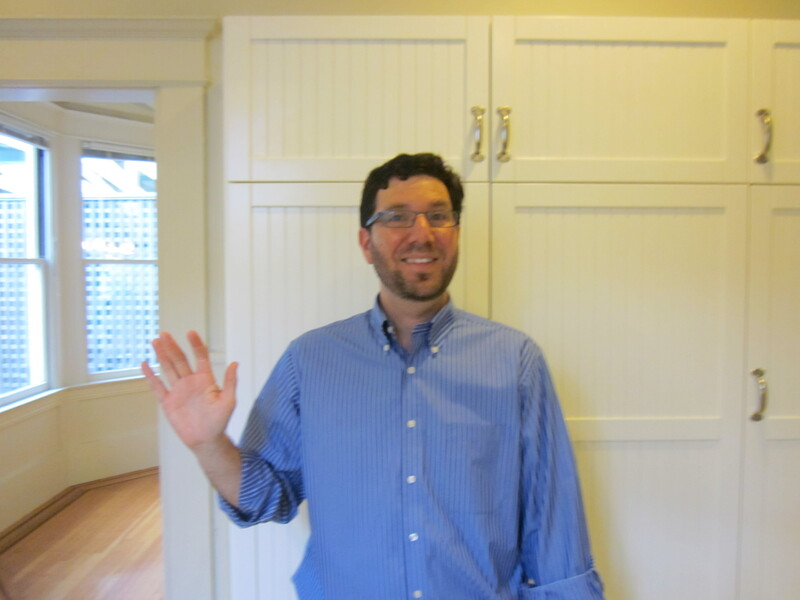 Instead we drove to Berkeley to have brunch with my mother-in-law. This is always a slog but we had a nice time once we were there. But when I came down first thing in the morning, the kids were already awake. They wanted to show me the cards and vignette they’d made me. 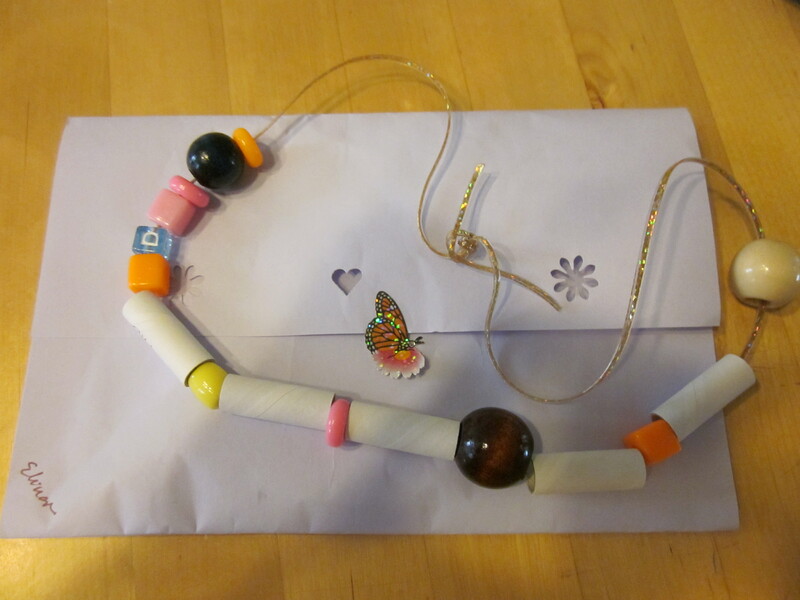 My daughter was enormously pleased that she’d found a “D” for my name to put on the necklace she made. 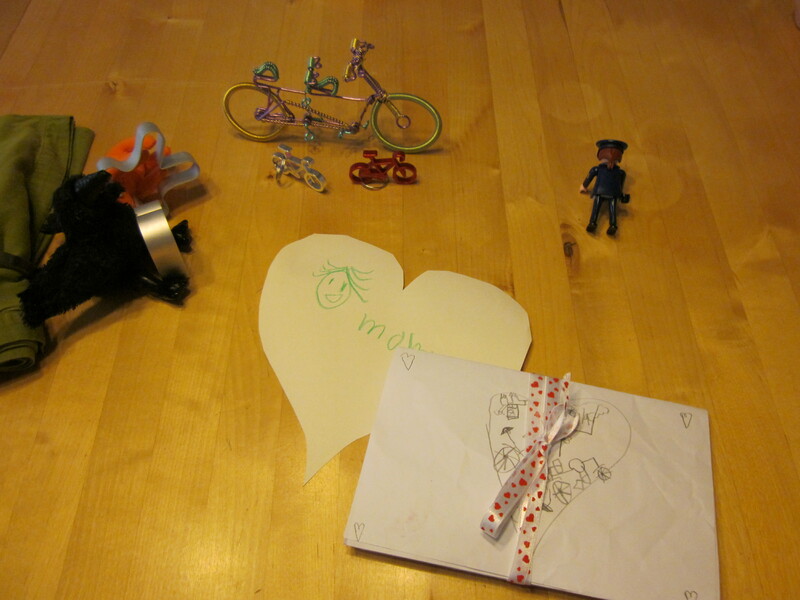 My son had made me a poster (which his sister tore, unfortunately, but we taped it back up) and a two-sided card, as well as a display that he felt evoked all of my favorite things. 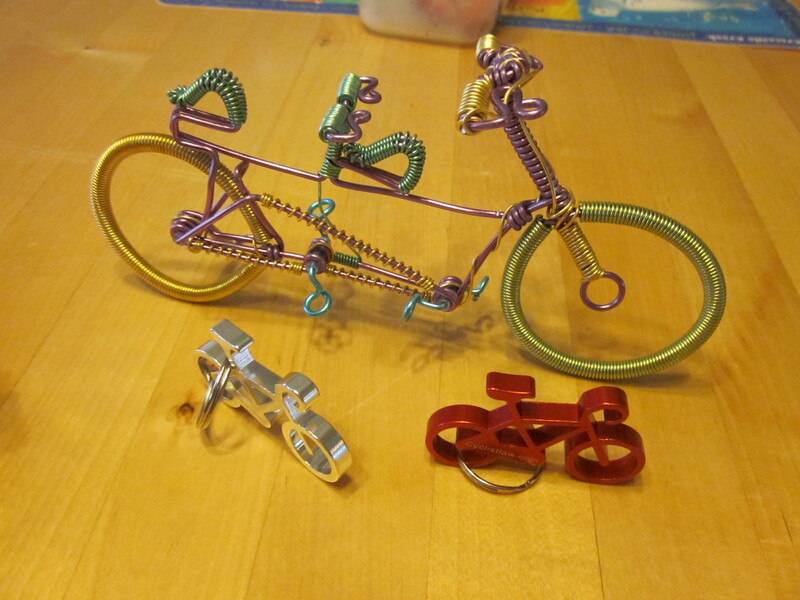 This display included the wire model tandem bicycle Matt had brought back from his last China trip (complete with tiny wire brake cables; I still love the way that Chinese bicycles, apparently even the model ones, come complete with all accessories), the bicycle key chains they had gotten from Bike to Work Day, stuffed toys, and a necklace made by my daughter at preschool. 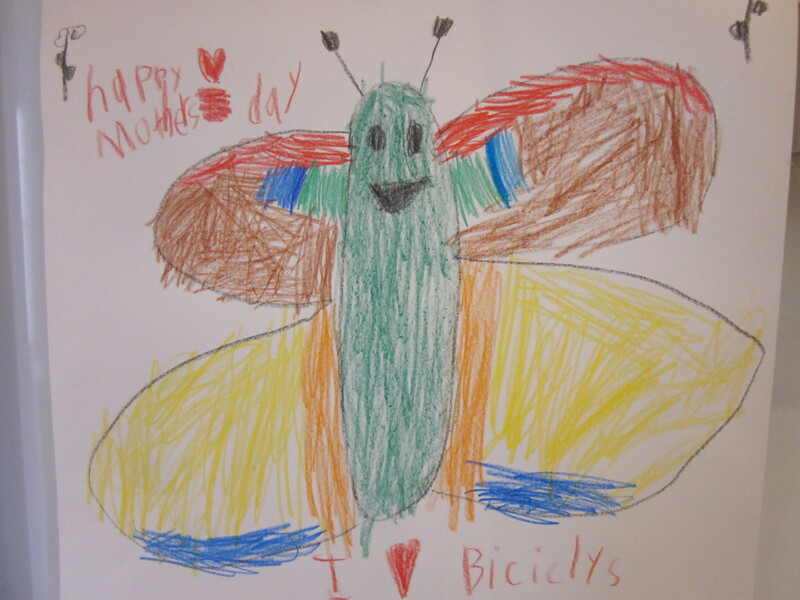 My son’s butterfly poster is more true than I realized at first; being a mother made me transform into something new. It’s true that we eat salad for dinner twice a week at my instigation. It is a struggle, to be honest. Most of the time I would rather have a glass of wine and a bowl of cereal, but these aren’t the eating habits I want to model, particularly because I remember what my health was like when I actually ate that way. So instead I have embarked on this long journey of trying to eat primarily vegetables at every meal (except breakfast, when we eat fruit). I could not have been more surprised to learn that apparently, I have been successful in convincing my children that this choice expresses some underlying preference on my part. And of course my son and daughter are two of my favorite people. Not only are they incredible in their own right, they see me as a better person than I really am. Who could ask for more on any day of the year? 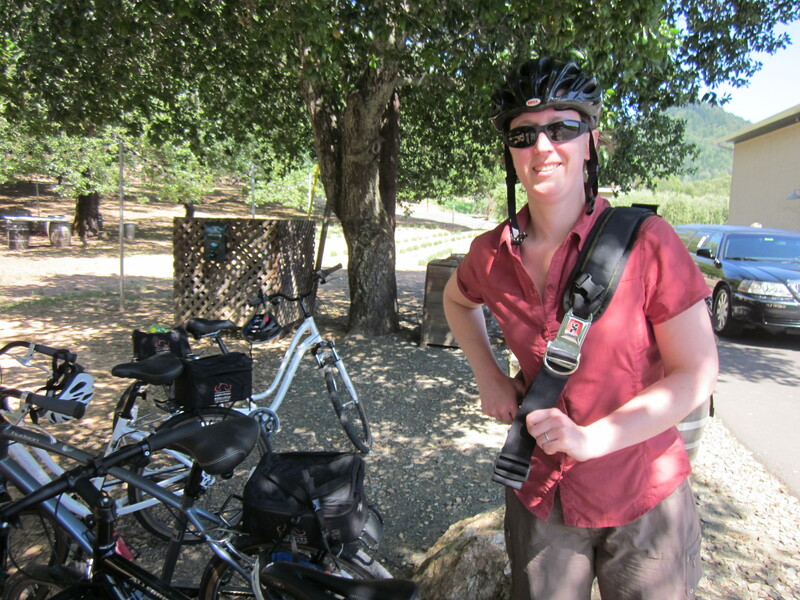 On Saturday I met my sister and we headed to the wine country for a long ride. This was my first attempt at driving somewhere to ride a bike. I’ll admit that it was a little overwhelming. As things head into summer, the wine country gets more and more crowded. Napa in particular turns into a parking lot on the one highway rolling through it, as everyone is trying to go to the same places on a single road. I hadn’t been there in summer for years, not since a visit in graduate school with friends where we ended up sitting in traffic for four hours at the end of the day while watching cars pull over to disgorge visibly drunk passengers (and sometimes drivers) who threw up at the side of road. What is it with driving and vomiting? Road closed (to cars): no problem! 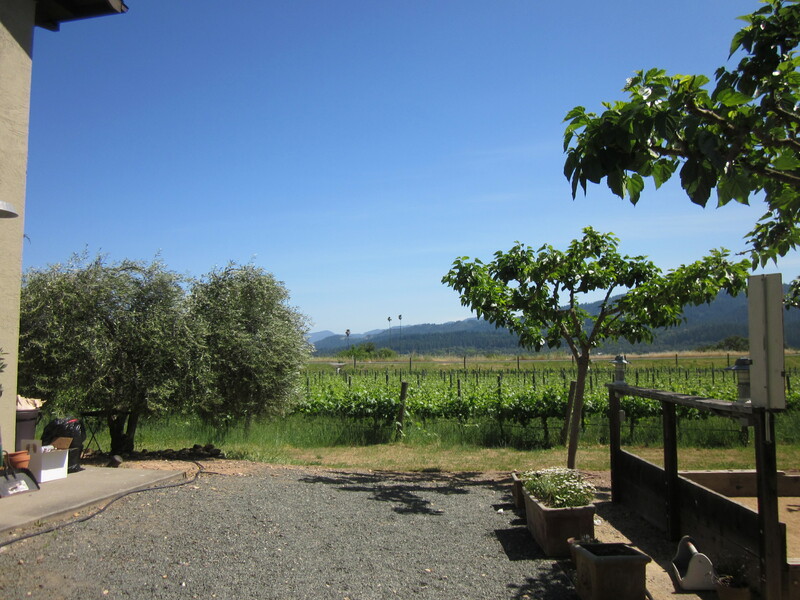 But the wine country is pretty and it seemed like a nice way to spend a few hours with my sister without interruption. It took longer than I remembered to get up north, with all the traffic, but I didn’t mind much because the company was good. 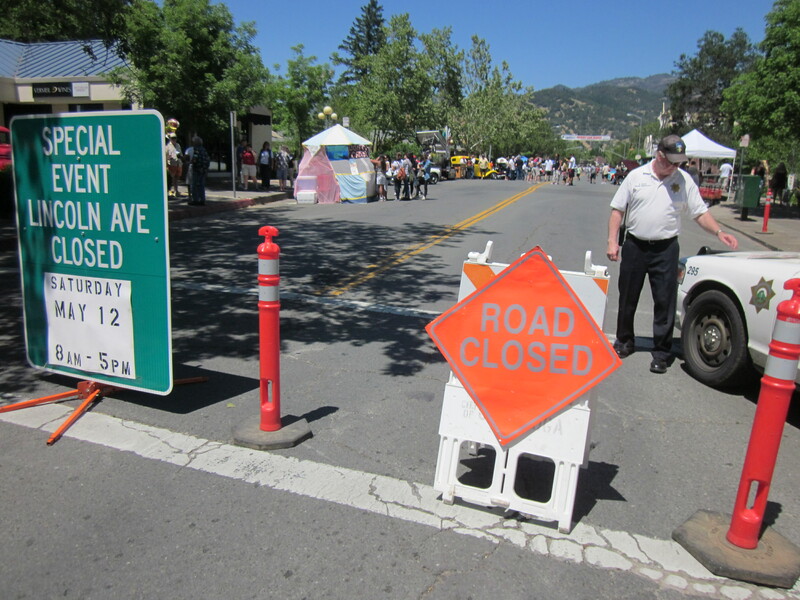 When we got to Calistoga, the road was closed. No problem! We headed away from the town center until it was easy to park, then rode our bikes back. Walking around looking at muscle cars: this seemed weird. 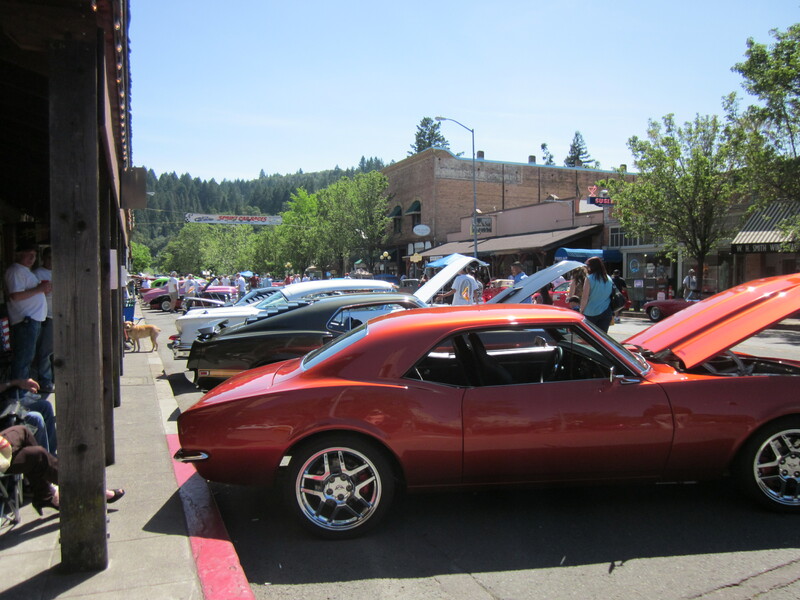 It turned out that the road was closed for a classic/muscle car festival. The irony inherent in closing off the street so that people could walk around and look at cars amused me. At any rate, by the time we finished lunch and started riding it was pretty late. But it was still extremely hot, around 90 degrees. Living in San Francisco, west of the fog line, I haven’t been within 10 degrees of that temperature in years. So I was moving pretty slowly. 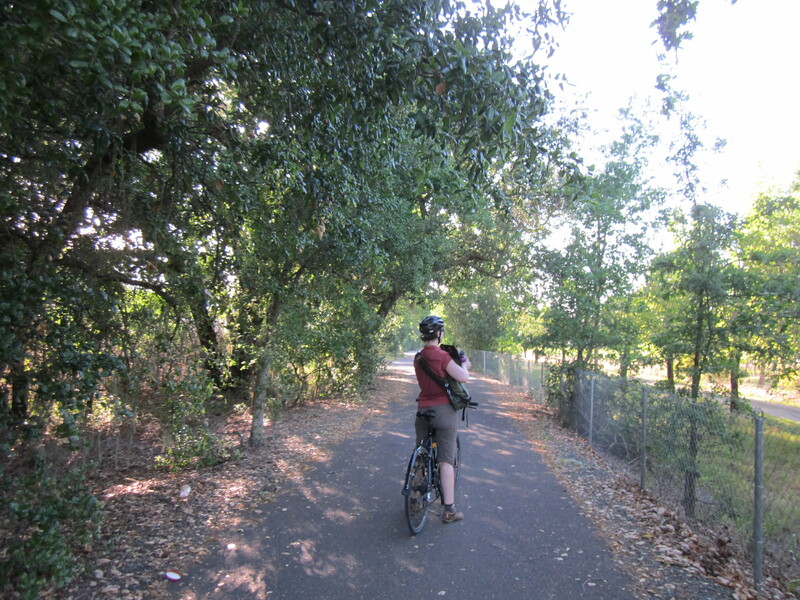 To my surprise, the wine country does not offer much in the way of dedicated bike paths. So we mostly rode on the road, which offered a marked bike lane in the form of the road shoulder. Sometimes it was generous and sometimes it was narrow (like 8” wide along a rock wall). Mostly the pavement was smooth, but sometimes it was so rough it set my bell ringing. There were hills, the long and rolling kind, but that was fine. The heat was overwhelming for me, though. And then there were the drivers. People go to the wine country to drink. And they drive from winery to winery. The inevitable result is drunk driving. I came to appreciate the sight of limos, as they were almost guaranteed to be driven by sober people, who obeyed the speed limit, did not honk at people on bicycles (or to be fair, other cars), or swerve unpredictably. What, St. Helena? 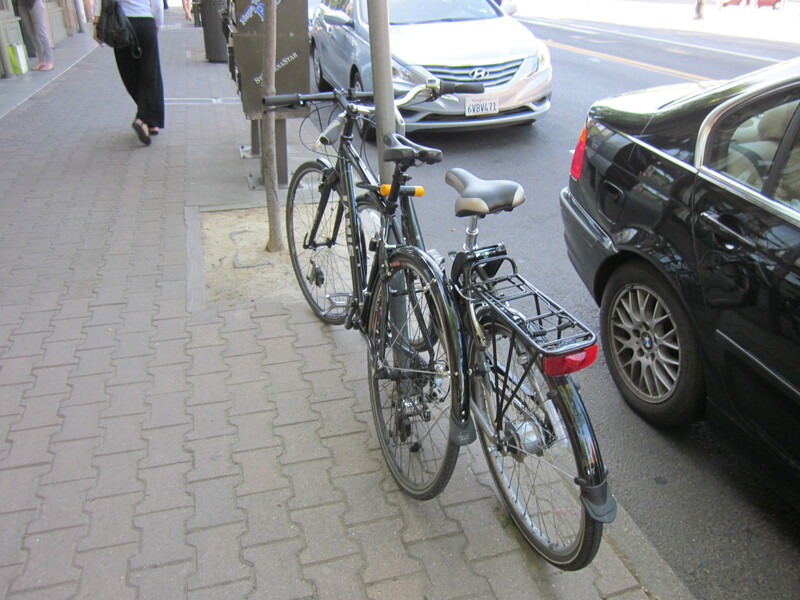 No bike racks? My sister had planned a route of 22 miles, but we agreed after riding a little while that we should cut the ride short. We had stopped a couple of wineries by then, and one even had a bike rack. We had seen some entertaining and quintessentially California sights, like palm trees growing in the middle of vineyards. I had my first experience of hitting a head wind so strong that I had to pedal down a long hill, which I actually enjoyed because it cooled me off. 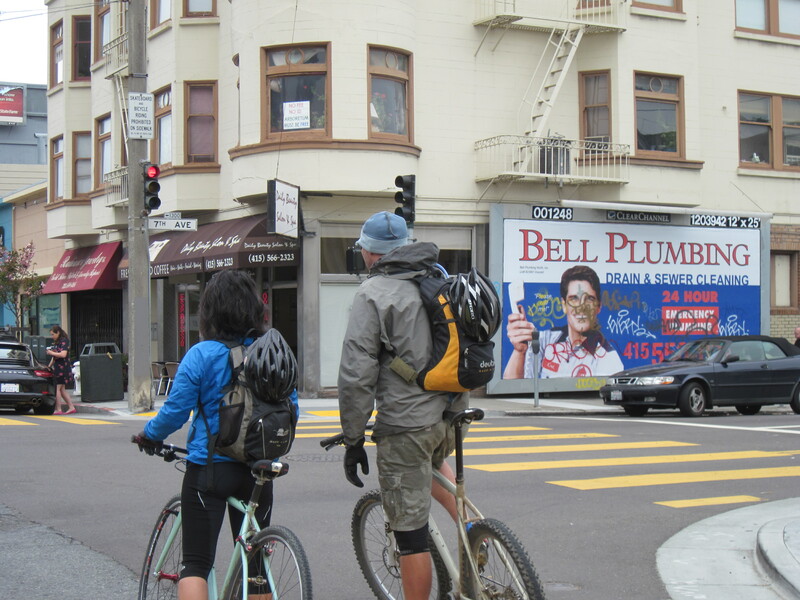 From a bike, wineries look oddly out of scale, like Vegas-sized attractions, given that they’re meant to catch the attention of people whizzing by at 50 miles per hour. 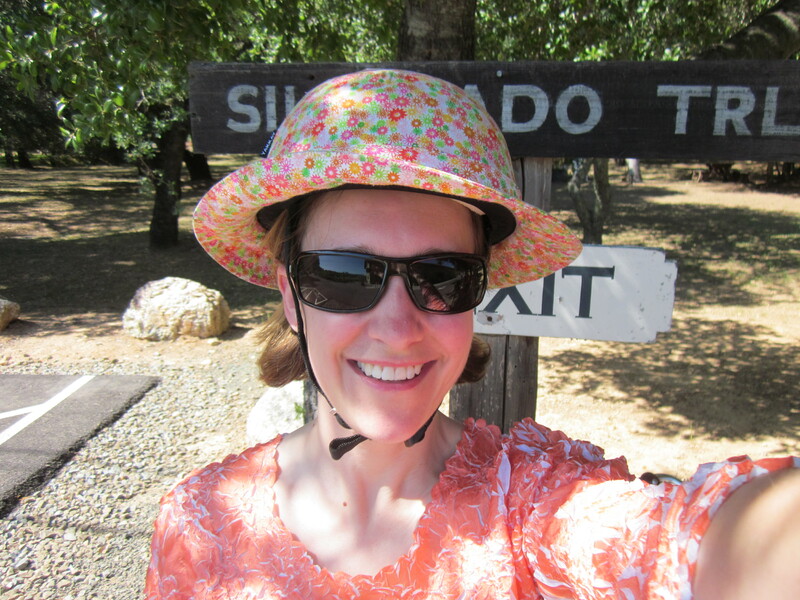 We headed to St. Helena to visit a bakery and chocolate shop and then turned back. Our shortcut ended up being 23 miles in total. Oops! Numb hands, numb seat. Would I go back to the wine country for a bike ride? Probably not, but it was still fun. Bike rides are always fun. And I liked having several uninterrupted hours of adult conversation with my sister. But it was too much driving for too little biking, and the drunk driving was unnerving. 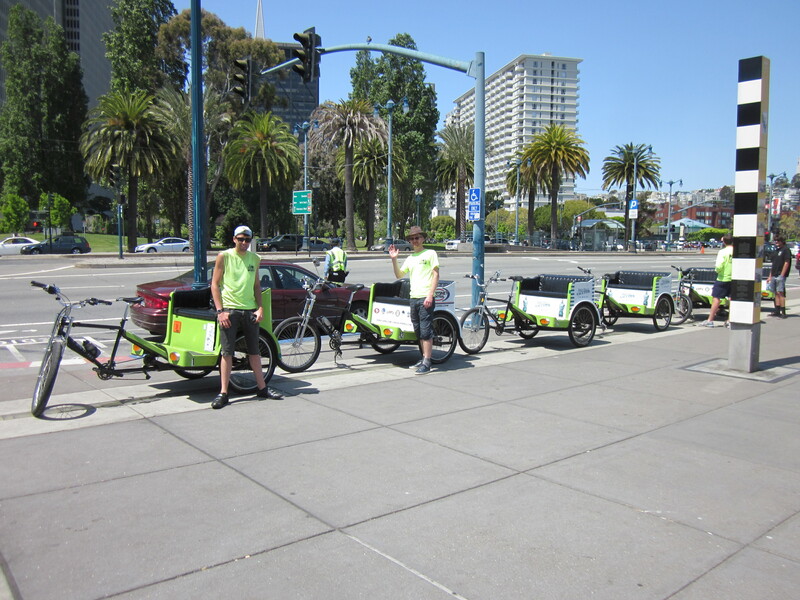 Next time I think we’ll ride around the city visiting wine bars. When I got the news of my promotion I bought a folding bike. But not just any folding bike: a Brompton. How come? Because it’s the only folding bike with a child seat, that’s how come. No bike will enter our lives for years to come unless it can haul the small. 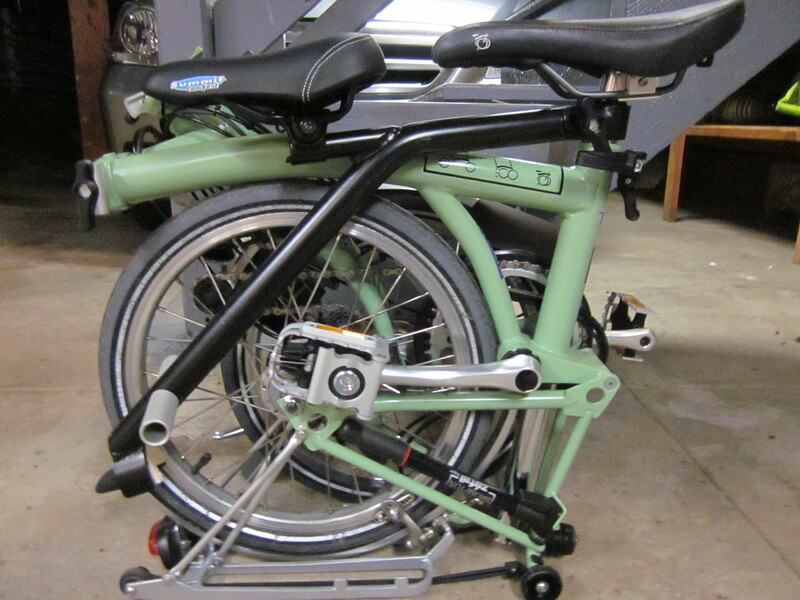 The Brompton is both outrageously goofy and breathtakingly awesome. 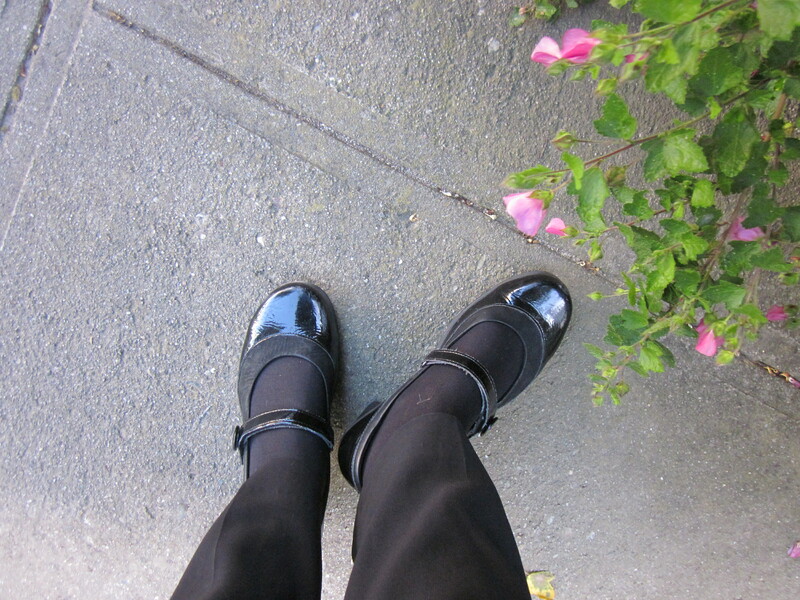 Even though I swear a blue streak at its makers every time I go up a steep hill (and I got the “San Francisco” gearing! ), I love this bike. And although I was not really looking for practicality, this may actually be the most practical bicycle purchase a city rider could make: it’s a utility bike. I am sidestepping the fundamental question here, which is why I got a folding bike at all. Part of the answer is that it was cool and unlike any other bike, which fit with my desire to get a bike that could compete with a pretentious chair. But most of the answer is that it seemed like a great bike for riding in the grittier parts of the city and for taking on the road. It makes bike rides possible that weren’t possible before. 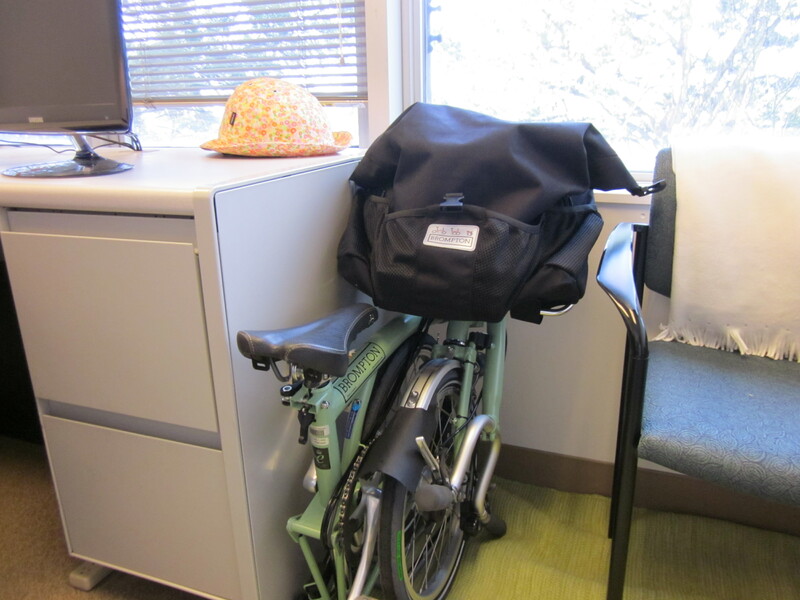 I would never lock up my Breezer outside when I am visiting homeless shelters in the Tenderloin, but there’s been no problem bringing a folding bike inside to meetings. 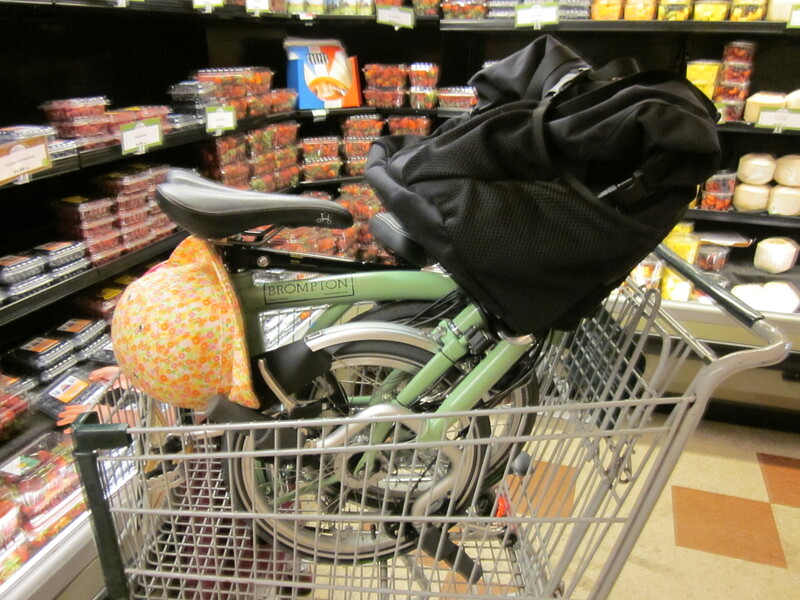 The Brompton also fits in a shopping cart at the grocery store, and when I don’t feel like locking it up, that’s exactly what I do with it. Moreover the Brompton is a clever travel bike. The Capitol Corridor Amtrak line that I took to Sacramento often runs out of bike spaces. Having been warned, I took the Brompton. The Amtrak folks recognized it instantly, but they do not count it as a bike. Later, when I hitched a ride in a friend’s car back to San Francisco, the Brompton fit in the trunk with plenty of room left over for our luggage. I may be taking an extended trip to Washington DC next year; if that happens, I will take the Brompton with me. If we lived in a small apartment again, this bike would easily fit in any random corner. The Brompton isn’t the cheapest folding bike you can buy, but it’s not the most expensive either. And this surprises me, because the incredible fold means you can put it almost anywhere. 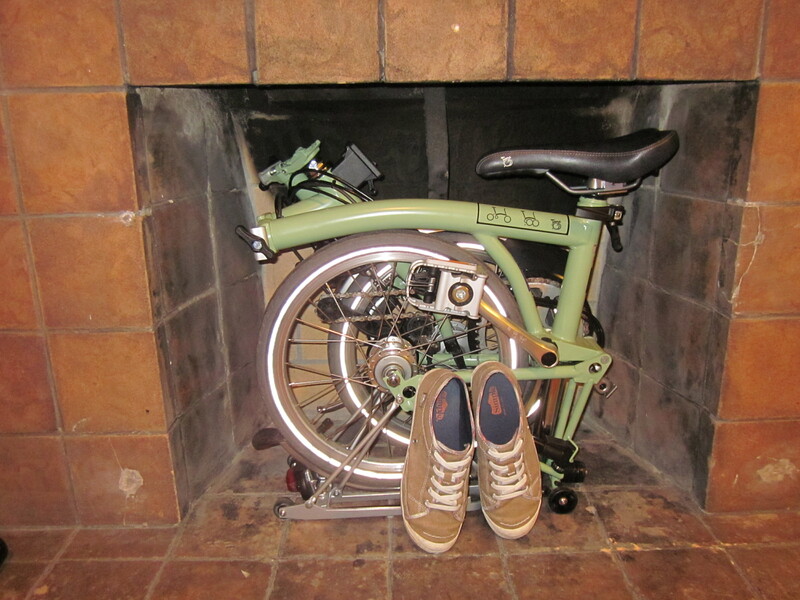 Most of the time mine hangs out in our non-functional fireplace, which it turns out is basically a Brompton-sized hole in the wall. 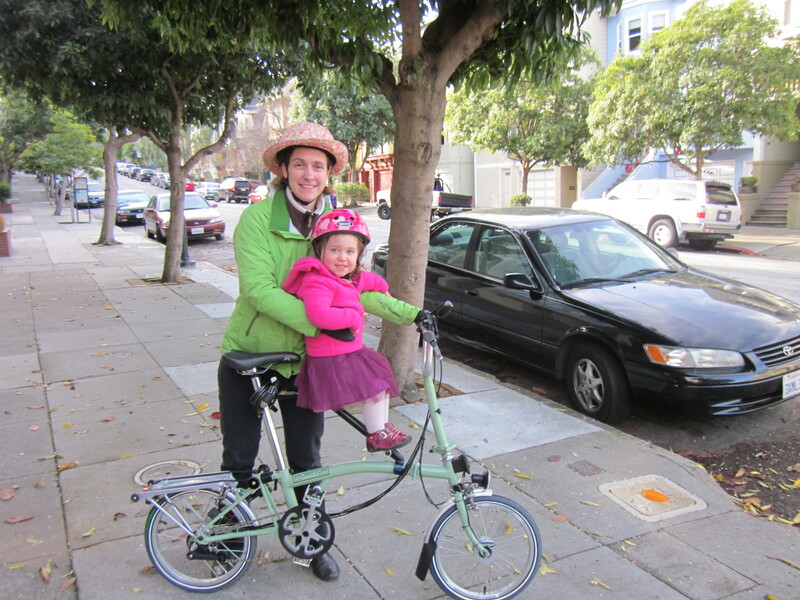 I ordered my Brompton from Warm Planet, which sells only folding bikes. They had never heard of the IT Chair before, but they didn’t have experience with any other child seats either. This may be the one bike shop that I forgive for this ignorance, as they primarily serve multi-modal commuters heading to CalTrain (they offer free bike valet parking every weekday). But they were bemused that such a thing existed, and impressed that it folded with the bike. The IT Chair had to be ordered from the UK after being hand-machined in Spain. It turns out that this takes a while, but it also takes a while to get a Brompton, so ultimately they arrived within a week of each other. This is good, because I refused on principle to pick up the bike without the child seat. The design of the IT Chair seems to have changed. Formerly it had folding footpegs, but my IT Chair does not. It makes folding the bike with the seat a little more tricky, and you have to get the sequence just right. It also is ridiculously, laughably expensive given that it is essentially just a piece of bent pipe. On the other hand, given the sporadic-at-best production line, IT Chairs apparently lose nearly zero value on resale, when the time comes that we can no longer use it. We were unable to find one used, but did find lots of desperate requests for them posted in the years when they weren’t being made. My daughter loves the IT Chair. Given the choice, she always asks to ride “mommy’s present bike.” She loves it because she can stand on the footpegs and ring (and ring and ring) the bell. I love it because a front seat is outrageously fun and makes conversation with her easy. My former experience with a front seat (the Co-Rider debacle) was not reassuring. But my brother-in-law assures me that design-wise, the IT Chair is bombproof, for all practical purposes an extension of the frame. To my surprise, he loved the Brompton, and proposed that we should get one for everyone in the family, once the kids are big enough, arguing that we could park four Bromptons in the space of one ordinary bike. In the meantime, my son has thus far refused to ride the IT Chair, as the design does not appeal to his cautious nature (no kid handlebars). But recently he realized that his reluctance meant that his sister has now ridden more bikes than he has, and evidently this will not stand. I was surprised at some of the ways that the Brompton excels. Its fenders are the best I’ve ever seen, so this is now my bike of choice for rainy day commutes. Assuming (correctly), that putting a kid on the bike would imply lots of things to carry, I also got the largest Brompton bag, the T-bag (an extremely poor choice of name). 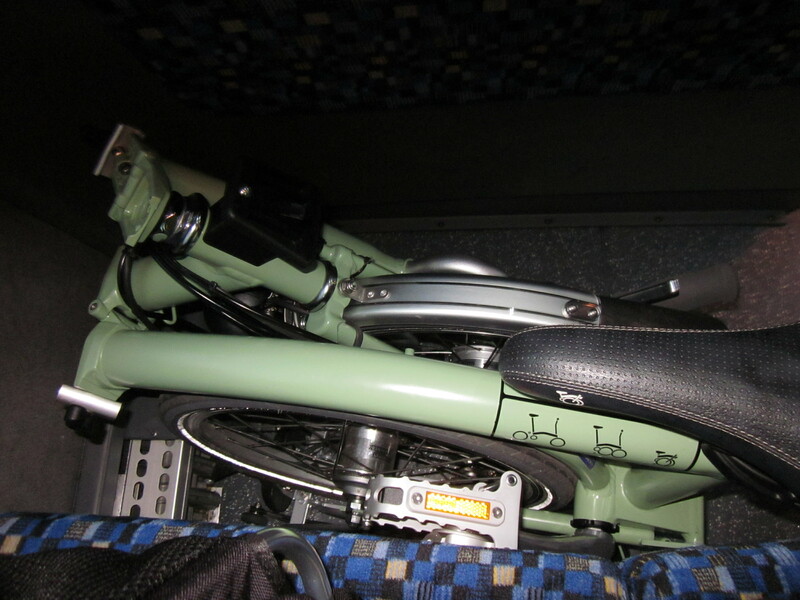 All the Brompton bags are frame-mounted, which means that they can haul massive amounts of weight. And although I find the bag sort of ugly, it is big enough to hold all four of our helmets when parked at the bike valet, plus a few jackets. With this kind of cargo space, plus the small footprint, the Brompton has also become our bike of choice for trips to the farmers’ market. It effortlessly manages a week’s worth of groceries, up to and including a half-flat of strawberries and Matt’s boxes of wine. It doesn’t do everything well. Although there are people who take this bike on long trips, I prefer my Breezer for distances longer than a few miles, particularly given that my daughter likes to stand up on the footpegs while we’re riding. And then there are the hills. For mild to moderate inclines, the supposedly-designed-for-hills gearing I got is more than adequate, even pleasant, although the shifting itself is bizarre, as it switches between an internal hub and a derailleur, so every gear change involves both handlebars. When I hit a steep incline, however, it suddenly feels like I’m dragging a cinder block behind the bike. I’ll admit that this may be because I’m often hauling more weight at the front of the bike than it was really designed to carry when I put both a preschooler in the IT Chair and a week’s worth of groceries in the bag. (And it doesn’t help at all when that preschooler decides it would be fun to shift the gears randomly. This is a downside of the front seat. That and the endless bell ringing.) But it can be a problem even on days when I am relatively unladen. I appreciate that this problem may be unique to San Francisco. Let us say that this bike has made me stronger. Getting a Brompton also involved the purchase of several pricey accessories. It’s a good thing that I was thinking of this as a “yay, I got a promotion” bike, because otherwise the total cost of all the extras could have ruined my mood. The IT Chair is the most obvious (price varies based on exchange rate at the time of order, assuming it’s in production), and the Brompton frame-mounted bags are expensive as well. It also turns out that it is difficult, if not impossible, to lock up a Brompton with a typical U-lock, and in San Francisco we do sometimes go places that are so small that even a folded Brompton is unwelcome. So on the recommendation of other folding bike owners I ended up getting a folding lock to go with my folding bike, the Abus Bordo Granit X-Plus. (However this lock is so fabulous that I ended up using it all the time. Matt asks to use it when we go out on rides together. So I can only really claim part of the price of this lock is specific to the Brompton.) On the other hand, the Ikea Dimpa bag that I sometimes use to carry it around was a steal at $4. Somebody at Ikea owns a Brompton. Yet I would get this bike again in a heartbeat. It is surprisingly fun to ride, nimble and responsive. It is also fun to fold and unfold, and although it weighs are much as my daughter with all the accessories, it is fun to carry around. (I’m carrying my daughter around all the time anyway, so it’s not like a bike that weighs the same amount is a big deal.) It is safe in places where other bikes are not. It goes almost anywhere and stores almost anywhere. The Brompton may be the ultimate city bike. As a celebration of my promotion, it is infinitely better than a set of pretentious chairs. The attention we get on the bike still surprises me a little, because riding it seems unremarkable to us now, but I find myself minding this less over time. The Brompton turns out to be the ultimate ambassador of family biking for people who’ve never thought of riding with kids before, which I find funny, because to me, my Brompton still looks like a clown bike. 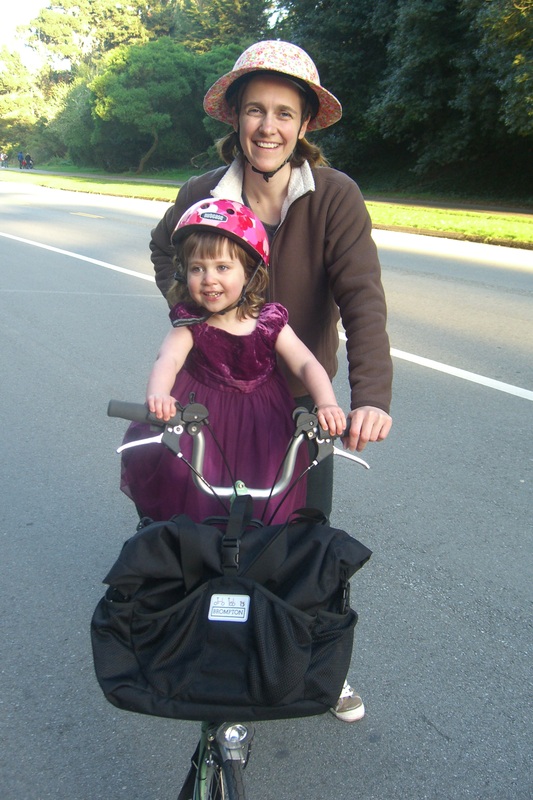 I think it seems less intimidating than a cargo bike; some moms see longtails and box-bikes and can’t imagine maneuvering them, but it is immediately obvious that any able-bodied person could handle a Brompton–and mine is usually hauling both a kid and two bags of groceries. (It could even haul two kids with a Trail-Gator, which another parent at our son’s school suggested.) And the Brompton, although it is by no means a cheap bike, costs less than a traditional cargo bike. The Brompton is not my everyday bike, but I ride it every week. It proved to me that you should buy the cool bike. I keep it in the living room! And I smile every time I see it.